Upon the recommendation of the Nominations, Governance, Sustainability & Responsibility Committee, Pernod Ricard’s (Paris:RI) Board of Directors has created the position of Lead Independent Director. The Board unanimously appointed with immediate effect Mrs. Patricia Barbizet to fulfill the role of Lead Independent Director. The Board of Directors considers that Mrs. Barbizet, who is widely-known for her expertise in the field of governance, possesses all the requisite skills and necessary competencies to actively contribute to further guaranteeing Pernod Ricard’s balanced corporate governance. Such evolution of Pernod Ricard’s governance reflects the company’s willingness to strive for continuous improvement. In accordance with best practices, the Lead Independent Director will be in charge of the Board’s shareholder engagement relationship, in particular on corporate governance matters, and will oversee the efficiency of the company’s governance and submit proposals to continue to improve and reinforce Pernod Ricard’s governance profile. The Lead Independent Director will also chair the Nominations, Governance Sustainability & Responsability Committee, in replacement of Mrs. Nicole Bouton who has decided to step down from this position. The Lead Independent Director’s role and responsibilities are detailed in the Board of Directors’ internal regulations. Pernod Ricard is the world’s n°2 in wines and spirits with consolidated Sales of €8,987 million in FY18. Created in 1975 by the merger of Ricard and Pernod, the Group has undergone sustained development, based on both organic growth and acquisitions: Seagram (2001), Allied Domecq (2005) and Vin&Sprit (2008). Pernod Ricard holds one of the most prestigious brand portfolios in the sector: Absolut Vodka, Ricard pastis, Ballantine’s, Chivas Regal, Royal Salute and The Glenlivet Scotch whiskies, Jameson Irish whiskey, Martell cognac, Havana Club rum, Beefeater gin, Malibu liqueur, Mumm and Perrier-Jouët champagnes, as well Jacob’s Creek, Brancott Estate, Campo Viejo and Kenwood wines. 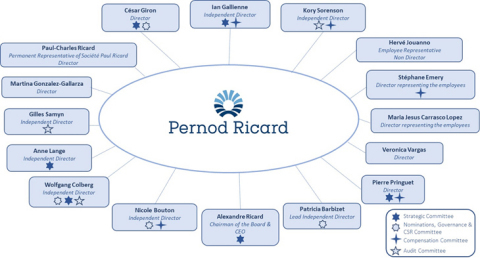 Pernod Ricard employs a workforce of approximately 18,900 people and operates through a decentralised organisation, with 6 “Brand Companies” and 86 “Market Companies” established in each key market. Pernod Ricard is strongly committed to a sustainable development policy and encourages responsible consumption. Pernod Ricard’s strategy and ambition are based on 3 key values that guide its expansion: entrepreneurial spirit, mutual trust and strong sense of ethics.